Is it an herb or a weed? Either way it’s delicious and a staple in Greek kitchens. Fresh, dried, even frozen,dill or άνηθο (anitho) is easy herb to keep on hand year round. 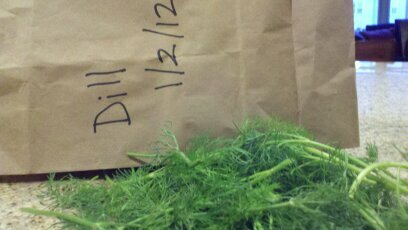 Fresh dill is my first choice in most recipes. 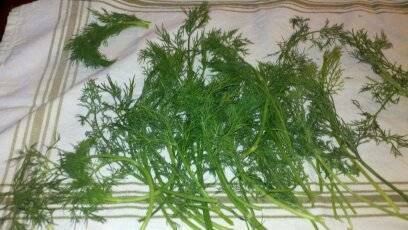 Whether it comes from your garden, farmer’s market or grocery store always give fresh dill a gentle rinse. I like to spread it out on a clean dish towel, pat dry and leave it to sit for a bit to make sure it’s good and dry before I cook with, dry or freeze it. On top of some great health benefits, dill has such a pretty scent and sweet, delicate flavor. When it’s growing in the garden, I love to run my hand over the top of the plants and feel the soft, feathery tops so different from most other herbs. 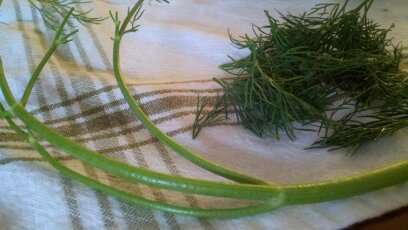 With fresh dill, gently pinch the ‘leaves’ away from the stem. I’ve never heard of using the stems for cooking or in vegetable stock so they just go into the compost. 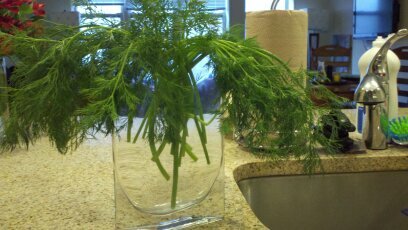 A fun and practical way to store fresh dill for a few days at least is to stand the stems up in a flower vase of tall glass filled with water. I often do this when I’ve a big bunch and leave it right on the kitchen counter. Easy to access and lovely to look at. This isn’t the greatest picture but it gives you the idea! 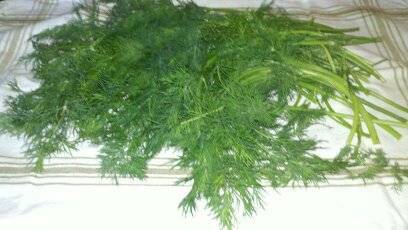 Dill dries very nicely and is easy to do yourself. I don’t think I’ve bought dried dill in the store more than a couple of times. There really isn’t any need to and by drying your own you always know exactly how old it is. I just take the washed, dried leaves on the stem and place them in a brown paper lunch bag. I write the date on the front and keep it in a cool place away from the heat of the sun or stove. About two to three times a week, I gently shake the bag to keep air moving around all the leaves. After about 3 weeks, I turn out the contents of the bag and coax any leaves remaining from their stems and keep the leaves in a glass jar. I’ve been know, when space permits, to leave the dried leaves right in the bag and use them as needed. Though I’ve tried other methods, the brown bag is quick, simple and works – can’t beat that. I use probably about 3 times the amount of dried dill as fresh. The flavor is definitely more subtle so keep that in mind when seasoning with dried. I’m not a fan of freezing, just never had good luck with it. From what I understand, the flavor of properly frozen dill is fantastic, almost as good as fresh. At dinner the other night, I was talking about writing this post and my brother and sister-in-law told me they always freeze their dill and have promised to email me their method. I’ll update this post when they do.